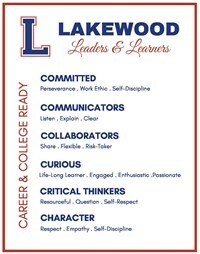 Lakewood School District, in a unified partnership with families and community, is committed to providing all students maximum opportunities to develop as life-long learners and productive citizens. We value Academics, Arts and Athletics. Our purpose is to educate and care for the whole student. We aim to graduate our students to a post-high school experience that is fruitful and positive, whether that is a 2 or 4-year degree program, apprenticeship, work placement or military service. Our goal will always be for students to leave our schools ready for career and college. We work to develop the whole child by teaching and nurturing students through our Leaders and Learners program at all grade levels. Students are taught from a very young age to collaborate, be curious, be creative, critically think, communicate, commit and show good character. These are skills that are critical for success in school, the work force and community. Our district is located in Licking County along the I-70 Corridor, just off State Route 79 in Hebron. We are only 30 minutes outside Columbus, providing easy access to the city as well as larger suburbs like New Albany, Pickerington and Reynoldsburg. When you are looking for a small town, family oriented lifestyle with easy access to downtown amenities, Lakewood is the perfect location. It is a beautiful community featuring rolling hills, 600 acres of parks, historic Buckeye Lake, Dawes Arboretum, and 25 miles of trails and bike paths. There is also easy access to restaurants and shopping with great local spots in Hebron and Buckeye Lake, many of your chain restaurant favorites and the mall in Heath, and boutiques and restaurants in Newark, the county seat. We are also located in the industrial center of Licking County. Within our district and Licking County are the Mid-Ohio Industrial park, Etna Corporate Park, Central Ohio Aerospace and Technology Campus, and Newark Industrial park, home to Hendrickson, MPW and THK, just to name a few. And local industry continues to grow with the recent addition of Bath & Body Works new distribution center and Amazon’s fulfillment center. Our location is also close to a number of colleges, universities and technical schools: Denison, OSU Newark, OU Zanesville, C-TEC, Central Ohio Technical College are all within 20 minutes of our schools. Additionally, central Ohio schools like OSU, CCAD and Otterbein or Muskingum University in New Concord are about a 30 minute drive.